I hope you have all recovered from the food-induced sleepiness that is always sure to hit me at Christmas and have had a wonderful time with your loved ones! This is gonna be hard for me, cause I want to list so many, but here goes. 1. The Wise Man's Fear by Patrick Rothfuss: I have waited SO LONG for this book!! And it was AMAZING! If you haven't read the first book in this series, the Name of the Wind, and you enjoy fantasy, you should read it, cause it's awesome! Also, I need the next book, like yesterday! 2. The Near Witch by Victoria Schwab: this book! THIS BOOK! It was so insanely amazing I wrote a gushing review about it! This book made me believe in fairytales again and it was wonderfully beautiful! 3. Witchlanders by Lena Coakley: EPIC FANTASY! I love fantasy, as you can probably guess from my list and this one was fabulous! I wonder how this has not gotten a lot of buzz, cause it's amazing! This is a book I want to shove at everyone and make them read it, and bonus: this book works for boys as well as girls. Virtually no romance, but lots of amazing storytelling. 5. The Rose Garden by Susanna Kearsley: this book took me by surprise, as I hadn't expected to love it so much! It is a pretty clean historical and contemporary romance novel as the main character travels back and forth in time and it is simply wonderful! I felt shocked, I cried, I was yelling for them to KISS ALREADY!! And I didn't care it got me funny looks! 6. The Girl of Fire and Thorns by Rae Carson: another fantasy, this was a good fantasy year it seems ;) I LOVED this book! It has a strong female lead and I'm dying to find out what happens next for Elisa! The Godstone is fascinating! 8. Unearthly by Cynthia Hand: so, confession: angel books haven't really been working so well for me, but THIS ONE DID!! Seriously, there's virtually no preaching and Clara is wonderful and I am so Team Tucker with his amazing boy-ness being swoonworthy and all! I have been lucky enough to have already read Hallowed, and it is also amazing! 9. The Kingdom of Gods by N.K. Jemisin: I have fallen in love with this whole series and I think I can safely say this one is my favourite of the trilogy! It focuses on Sieh and is just wonderful. I read this during the Dewey 24-hour Read-a-Thon and didn't once feel the inclination to sleep. It was THAT good. 11. Princess for Hire and The Royal Treatment by Lindsey Leavitt: SO EXTREMELY CUTE! These are the first 2 books in a MG series and it is fabulous! I love the whole idea of substituting for princesses! I wish I had a little girl in my life I could give these books to! 12. Tuesdays at the Castle by Jessica Day George: another MG and ADORABLE! I had a huge grin on my face while I was reading this and I loved every minute of it! As the abovementioned Princess for Hire series, I would love to have a little girl I could give this too! Glad to see The Wise Man's Fear made your list too! I'm dying for the third book as well - hope we don't have to wait 3-4 years this time. Daisy! As always, you have some great books on your list - most of which I am now dying to check out. I definitely trust your judgment when it comes to books and can't wait to read some of the ones on this list! Great list. Delirium was one of my favs too but didn't make it to my list. Narrowing it down to 10 was so hard to do. Great list. I have heard so many great things about Unearthly. I must read it! Check out my Top ten. Plus a giveaway! I loved that you couldn't stick with just 10. That's just way too hard. And YAY for Die for Me. I love those Revenants! If I hadn't read Delirium and Unearthly in 2010 they both would be on my list, too. I really should check out the series by Patrick Rothfuss if it's as good as you say it is. great list. it's hard to limit it to 10! at least that means you had a great reading year! i HAVE to read delirium! Fantastic list! I loved Unearthly, The Girl of Fire and Thorns, and Delirium too!! Great list! I must read Unearthly and Die for Me. Ooh! There are so many books on your list that are still on my TBR pile. I've owned The Wise Man's Fear for almost 2 years now and I haven't read it yet. I need to get on that. I HAVE read some Susanna Kearsley, though (The Winter Sea), and she's great. I need to read The Rose Garden, too. I could pretty much say, "I need to read that, too" for all of the books on your list except Delirium (awesome), The Near Witch (fab! )...and that's it, lol. Thanks for reminding me of these books! I've read a few things on your list though I must admit that most of them are in my tbr pile. Glad you enjoyed them so much! Oh my goodness! I completely forgot to add Princess for Hire to my list! I love that series so so much! I did add Lindsey Leavitt's YA, Sean Griswold's Head, though. Love that one too! If you haven't read Sean Griswold's Head, I highly recommend it! This was a tough one for me, mostly because I have a terrible memory for what I read through the year! I will have to keep better records in 2012 . . .
Unearthly is the best angel book I've read so far. I can't wait for Hallowed! So many good books, so little time. While Unearthly didn't make my top 10, it was most definitely a great book. First time doing Top Ten -- a great meme! Thanks for hosting it. It's been a fun year, I'm looking forward to more top ten this year. Thanks for being such great hosts. Happy New Year! I want to read Unearthly so bad! I will definitely have to get it now. Great list. N.K. Jemisin made my top ten list, too. It was a good year for fantasy, and I can't wait to read many of these on your list. Delirium is the only one on your list that I've read - but I have a feeling some of your other choices may make my list for best of 2012! Great topic--I had so much fun going back through all the books I'd read and reviewed in 2011. Thanks so much to all of you for a great year of Top Ten Tuesdays! Your faithfully-posted, consistently interesting topics are a huge help to me as a blogger. :) Happy New Year! I love your list! I absolutely love the Seven Realms series! I read the 1st 2 books last year, but still haven't read The Gray Wolf Throne! I also loved The Name of the Wind, but still haven't read The Wise Man's Fear. I also loved Witchlanders & The Near Witch :) The rest are on my tbr list! I couldn't possibly narrow it down to ten books! There are a lot on your list that would be on mine...like Delirium, Unearthly, and The Near Witch. I loved Delirium but it didn't make my list because I read an ARC in 2010. I did read Pandemonium this year and it was amazing! I am glad to see The Girl of Fire and Thorns on your list. It is probably my second favorite YA debut this year. I also loved The Rose Garden though I prefer The Winter Sea. Fantastic list! I will have to check out Witchlanders sometime. I liked this very much! Love to share my favourites!! Awesome choices! Some I've heard of, but some I haven't! Thanks for the heads up! This is my first week participating!! Ah!! I totally agree about the Wise Man's Fear!!!!! I had to say that even tho I'm not participating today - three posts is plenty in one day. Yikes!! :-) LOVE your Meme, tho!! Narrowing it down to ten was so much harder than I though it would be! That was a hard task. I cheated a bit and added a series in the place of one spot. I was able to post it in time though, just an hour until Wednesday. Oh, I forgot to note that I picked up Witchlanders on a whim the other day at B and N. I was so excited to see it as #3 on your list. 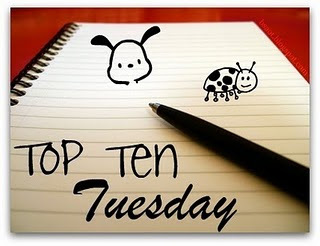 This made for a great Top Ten Tuesday, even if it was tough to choose just ten! I've never read anything on your list but thanks for the chance to reflect on my 2011 reads! I had several of these on my wishlist and added the others. I can't believe I haven't read any and they all sound so amazing!! Insurgent is on my list too! The Dressmaker sounds really good as well.